With approximately 5,000 aircraft in the sky at any given time, the need for aircraft maintenance is in high demand. Aviation maintenance technicians are at the heart of every flight – commercial, private, or military. As a result, Boeing forecasts 754,000 new maintenance technician jobs worldwide by 2037. If you are passionate about aviation and enjoy complex problem solving, critical thinking, and repairing equipment, aviation maintenance may be an ideal position for you. As a recognized leader in aviation and aerospace education, Embry-Riddle’s Associate in Science in Aviation Maintenance degree helps technicians who want to grow their career as well as individuals who are new to the industry. Our expert faculty are industry professionals, who instill the necessary skills, knowledge, and hand-on experience needed to succeed in the aviation maintenance field. Leveraging online and face-to-face instruction, Embry-Riddle Worldwide allows aviation professionals to obtain the competitive edge of a first-rate education with flexibility that fits into their busy lifestyle. Our faculty are passionate about aviation and have first-hand experience within the industry. They meticulously train our students to examine, repair, and maintain aircraft at the highest level. The A.S. in Aviation Maintenance program offers an innovative curriculum comprised of 60 credit hours and a combination of general education and aviation maintenance core courses. Applicants with an FAA Airframe & Powerplant Maintenance Certificate may be awarded credit hours toward their degree. Upon graduation, students have in-depth knowledge of general aeronautics and applications, airframe structures, reciprocating engine theory, turbine engine theory, and more. Pursuing a degree at the Worldwide & Online Campus allows students to structure their education around their lifestyles. Students can take classes where and when they want. Education is the key to getting more out of life — whether you’re looking for a higher salary, greater job satisfaction, or a soaring sense of personal pride. If you work in the aircraft maintenance field and are ready for advancement, Embry-Riddle can help. 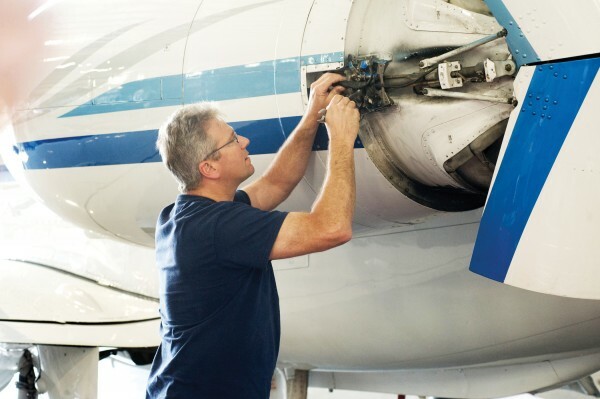 Our Associate in Science in Aviation Maintenance degree lets you build on the skills you already possess, while laying the foundation for greater accomplishments. If you hold an FAA Airframe & Powerplant Maintenance Certificate, you may be awarded up to 18 credit hours toward the associate degree or up to 30 credit hours toward the bachelor’s degree. Students may also earn maintenance credit as part of the overall curriculum. Plus, you’ll gain a solid core of courses in general education, which prepares graduates for success in any industry, not just aviation. In the aviation industry, the most crucial task is to keep the planes flying safely. That’s why people with aircraft maintenance skills and knowledge will continue to be in high demand by aviation and aeronautical employers. In today’s competitive workforce, however, it takes something extra to move up the career ladder. Aviation professionals can get that edge with an Associate in Science in Aviation Maintenance degree from Embry-Riddle Aeronautical University — Worldwide.